Lawrence Wong, the Singapore Minister for Culture, Community and Youth reminds me of a second-hand car salesman when I read about his recent remarks as to why the government is considering legislation to protect the name and images of Lee Kuan Yew. Ostensibly this proposed initiative is to prevent the “commercial exploitation” of Lee Kuan Yew’s name and images. Various media quoted Lawrence Wong as citing an example, the Singapore bakery which marketed a new line of Lee bu kai ni 李不开你 buns to coincide with the Lee Kuan Yew’s mourning period. The李 (Lee) as in Lee Kuan Yew, rhymes with 离 meaning leave. Hence Lee Bu Kai Ni means Can’t bear to Leave you. Touching stuff indeed. But somehow it did not go down well with the public. When citing the “bun” incident, it is unclear whether Lawrence Wong’s objection was because the buns from the BreadTalk bakery were not tasty enough, and “feel stale 90% of the time”, according to a complaint lodged by a Jumi Tan in the Straits Times facebook 24.3.2015. Or was it simply just too expensive at $2 a piece, as complained by another netizen Joseph Hiew to the Straits Times. Is this now the new politics of the post-Lky era – bun watching? Is it the Government’s duty to shoot down anything unbefitting to the memory of Lky because the dead man could no longer wield his libel law club to whack his critics? Or is there something more insidious brewing in the political cauldron that we ought to know? If was just plain and simple “commercial exploitation” that the government was concerned with, how would the Minister classify the display at Popular bookshop as depicted in this photograph taken during the mourning period. Wasn’t Popular also cashing in for commercial gain when they set up the altar with books in praise of Lky? In his remarks to the press, Lawrence Wong made reference to charity. “I think there is a very clear distinction between somebody who does it for charitable reasons, somebody who does it to pay tribute without making profit – and an individual or company who is specifically doing it for profit or commercial gain,” he said. Is Lawrence Wong’s explanation as clear as mud? In the case of BreadTalk, they were donating the proceeds of the sale of the offending buns to the community chest; however, this does not appear to be the case with Popular when they paid tribute to the “King of Singapore Politics”. Why was BreadTalk singled out for criticism and not Popular? How different were the these two commercial companies from those selling T-shirts and figurines of Lky for profits, which were cited by Lawrence Wong as further examples of unbefitting conduct requiring legislative injunction. If the government does proceed with the legislation, and if the reasons so far proffered by Lawrence Wong were to be believed, our highly paid Minister would not only be monitoring the profit intentions of bakeries, they would be keeping a close watch on profit-oriented peddlers selling non-copyrighted T-shirts and figurines of Lky, and would probably engage Interpol to monitor similar infringements in the whole of Asia. Does the lack of credibility, cogency and logic in Lawrence Wong’s presentation of the government’s intention betray a hidden and unspeakable agenda? I would treat Lawrence Wong’s reasons with as much scepticism as one should when talking to a second-hand car salesman flogging his wares. Is the Singapore government seriously telling the population that taxpayers ought to fund a task force to check every T-shirt and merchandise sold with the image of Lky just to ensure that any profits arising should be shared with the Lky’s Estate, or given to Charity? Why can’t the beneficiaries of the Lky estate be left to their own devices as would be the case with the families of any other celebrity? The clues to this otherwise pea-brain scheme are revealed in the word “tribute” used by Lawrence Wong and his assertion that the use of Lky’s name and images in tribute would need “approval”. If everyone is to be equal before the law, as stipulated in the Constitution, why should a dead Lky trump the freedom of expression of the living citizens. Lky is neither a divine being or a monarch, and citizens should not be required to apply for a licence, whether to praise, or to criticise or to lampoon him. The fact that Lawrence Wong only mentioned a scheme of approval for tribute automatically implies a blanket ban of future criticism. The only logical conclusion one can draw is that this proposed legislative initiative is designed to stifle any future criticism and inquiry into Lee Kuan Yew, the man, his policies, and his misdeeds during his term of office. The ultimate aim is to perpetuate the political dominance of the ruling Party by institutionalising its founder and his ideology. Is this not a modern step towards a Lee Dynasty? The ruling party is taking Singapore down the route to North Korea where only homage and tributes are allowed to be expressed to the Great Leader. By equating a dead politician’s name and images to that of the national flag, and other State emblems, the ruling party is undermining national unity by politicizing institutions of the State for their own political ends. 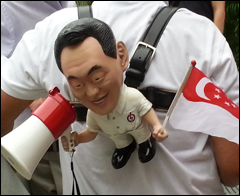 Is the PAP now moving Singapore further down the road towards a fascist* state with a dominant party and ideology? Once this proposal gets into the statute book – it will mark the beginning of the end of the Constitution. If the proposal is not consigned to the dustbin, there is a grave risk that anyone found criticizing ideas attributed to Lee Kuan Yew could be convicted for, call it by any name, lèse-majesté all the same. Oppositions beware. In a liberal democracy, the sovereignty lies with the people, and individual rights are enshrined in the Constitution, and protected by the judiciary. In contrast, a fascist state is one where the State is all powerful, and dictates terms over the citizenry. Rule of law is replaced with rule by draconian laws. The citizen only choice is to conform. Such a State is ruled by a dominant party, with a dominant ideology. Pressure groups are tolerated only within the strict framework of the dominant ideology, and are within the control of the dominant party. The dominant party claims to represent the interests of the people. It subverts democracy by ensuring that all the apparatus to the State are within its command. Strict discipline is imposed over the upper echelon of the dominant party to ensure uniformity of ideology and respectability. In return, they are rewarded with security of tenure, and wealth. Deviants from within the upper echelon are usually dealt with severely.